Presidential Foreword. Preface. Part 1. An Introduction to World Database Transfer Standards (H. Moellering). Part 2. Regional Summaries of Standards Development Activities in the World. Europe. Standardization in the field of geographic information: the European efforts (F. Salgé). North America. Spatial data standards activities in North America (R.L. Hogan, M. Sondheim). Asia/Pacific. Developing a geographic data infrastructure: an Asia/Pacific perspective (A.L. Clarke). ISO Activities. ISO standardization in the field of geographic information: the global perspective (O. Østensen). Part 3. Technical Characteristics for Assessing Standards for the Transfer of Spatial Data. (H. Moellering, K. Clement). Introduction. Explanations of terminology. Questionnaire. Assessment information. Administrative information. Transfer context. Transfer specification method. Conceptual data model/schema. Transfer process. Transfer elements. Update information. Query information. Quality information. Feature/object information. Attribute information. Relationship information. Metadata information. Part 4. Full International Descriptions of the Transfer Standards. Australia. Australia - spatial data transfer standard (AUS-SDTS) (A.L. Clarke). Austria. Austrian interface for digital exchange of geographic data (A2260) (W. Kuhn). Canada. Spatial archive and interchange format (SAIF) (M. Sondheim et al.). China. Data exchange format for information of surveying and mapping (DEFS) (Du Daosheng). Finland. EDI based geographic information sevice (JHS 111-119) (A. Rainio). France. Traitement de l'information geographique numerique: echange de donnees informatise dans le domaine de l'information geographique (EDIGéO) (F. Salgé). Germany. Einheitliche datenbankschnitt stelle (EDBS) für die automatisierte liegenschaftskarte (ALK) und das amtliche topographisch-kartographische informationssystem (ALK/ATKIS-EDBS) (H. Brüggemann, B. Salzborn-Schoepe). Israel. Israel exchange format 1991 (IEF'91) (A. Peled). Japan. Standard procedure and data format for digital mapping (SPDFDM) (Akira Yaguchi). Netherlands. Automated data processing. Interchange format for data of objects related to the Earth's surface (NEN 1878) (H.J.G.L. Aalders). Norway. Coordinated approach to spatial information (SOSI) (M. Borrebæk, O. Østensen). Russian Federation. Digital and electronic maps transfer standard (DEMTS). (A.I. Martynenko). South Africa. National standard for the exchange of digital geo-referenced information (NES). (A.K. Cooper) Spain. Norma de intercambio de cartografía catastral (NICCa) (S.Màs). Switzerland. INTERLIS, data exchange mechanism for LIS (INTERLIS) (H.R. Gnaegi, S. Nebiker). United Kingdom. Electronic transfer of geographic information (NTF). (M. Sowton). United States of America. Spatial data transfer standard (SDTS) (R.L. Hogan). Comité Européen des Responsables de la Cartographie Officielle. European territorial data base (ETDB) (F. Salgé). Comité Européen de Normalisation. Comité Technique 287 Secretariat. Full description of the CEN/TC287 family of standards (CEN/TC287) (F. Salgé). Comité Européen de Normalisation. Comité Technique 278/7 Secretariat. Geographic data files (GDF) (R. van Essen, K. Wevers). Digital Geographic Information Working Group. Digital Geographic Information Exchange Standard (DIGEST) (H. Dohmann et al.). International Hydrographic Organization. IHO transfer standard for digital hydrographic data (S-57) (R. Sandvik et al.). Index. 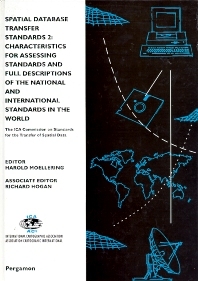 Crosstable of National and International Spatial Data Transfer Standards (H. Moellering). This book represents five and a half years of work by the ICA Commission on Standards for the Transfer of Spatial Data during the 1991- 95 ICA cycle. The effort began with the Commission working to develop a set of scientific characteristics by which every kind of spatial data transfer standard could be understood and assessed. This implies that every facet of the transfer process must be understood so that the scientific characteristics could be most efficiently specified. The members of the Commission spent hours looking at their own standard and many others, to ascertain how to specify most effectively the characteristic or subcharacteristic in question. The result is a set of internationally agreed scientific characteristics with 13 broad primary level classes of characteristics, 85 secondary characteristics, and about 220 tertiary characteristics that recognizes almost every possible capability that a spatial data transfer standard might have. It is recognized that no one standard possesses all of these characteristics, but contains a subset of these characteristics. However, these characteristics have been specified in such a way to facilitate understanding of individual standards, and use by interested parties of making comparisons for their own purposes. Although individual applications of a standard may be for different purposes, this set of characteristics provides a uniform measure by which the various standards may be assessed. The book presents an Introduction and four general chapters that describe the spatial data transfer standards activities happening in Europe, North America, Asia/Pacific, and the ISO community. This provides the context so the reader can more easily understand the scientific and technical framework from which a particular standard has come. The third section is a complete listing of all of the three levels of characteristics and their meaning by the inclusion of a set of definitions for terms used in the book. The fourth section, and by far the largest, contains 22 chapters that assess each of the major national and international spatial data transfer standards in the world in terms of all three levels of characteristics. Each assessment has been done by a Commission member who has been an active participant in the development of the standard being assessed in the native language of that standard. A cross-table chart is also provided. For all those interested in spatial data standards including cartography, geographic information systems, photogrammetry, remote sensing, surveying, hydrography, geodesy and vehicle navigation systems.